Special Offer - Orange Glass Bird Eyes. Concave/Convex monochrome bird eyes made from crystal and hand painted. Orange Glass Bird Eyes. Concave/Convex monochrome bird eyes made from crystal and hand painted. Orange/Red Glass Bird Eyes. Concave/Convex monochrome bird eyes made from crystal and hand painted. Light Orange/Black Glass Bird Eyes. Concave/Convex multicolour bird eyes made from crystal and hand painted. Light Grey/Orange Glass Bird Eyes. Concave/Convex multicolour bird eyes made from crystal and hand painted. Grey Glass Bird Eyes. Concave/Convex monochrome bird eyes made from crystal and hand painted. Light Orange/Orange Glass Bird Eyes. Concave/Convex multicolour bird eyes made from crystal and hand painted. Green Glass Bird Eyes. Concave/Convex monochrome bird eyes made from crystal and hand painted. Yellow Glass Bird Eyes. Concave/Convex monochrome bird eyes made from crystal and hand painted. Orange Glass Bird Eyes. A single colour iris with a black pupil on wire. Ideal for stickmaking and Decoy carving. Orange Frog Eyes with an oval pupil. 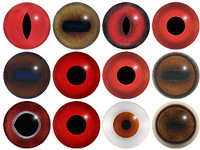 Eyes designed for amphibians. Dark Blue Glass Bird Eyes. Concave/Convex monochrome bird eyes made from crystal and hand painted. Blue/Grey Glass Bird Eyes. Concave/Convex monochrome bird eyes made from crystal and hand painted. White glass bird eyes. Concave/Convex monochrome bird eyes made from crystal and hand painted. Yellow/Orange Pheasant Eyes. This glass eye on wire has a multi-colour iris with a black pupil. Ideal for stickmaking and Decoy carving. Yellow/Orange Glass Bird Eyes. Concave/Convex multicolour bird eyes made from crystal and hand painted. Brown/Orange multicoloured Lizard or Snake eyes. Concave/convex reptile/dinosaur eye with a highly detailed colouration. Orange/Yellow Glass Bird Eyes. Concave/Convex multicolour bird eyes made from crystal and hand painted. Special Offer - Yellow Glass Bird Eyes. Concave/Convex monochrome bird eyes made from crystal and hand painted. Brown Glass Bird Eyes. Concave/Convex monochrome bird eyes made from crystal and hand painted. Orange - Red Glass Bird Eyes. A single colour iris with a black pupil on wire. Ideal for stickmaking and Decoy carving. Dark Grey Glass Bird Eyes. Concave/Convex monochrome bird eyes made from crystal and hand painted. Topaz Bird and Teddy Bear Eyes. A top quality Topaz crystal eye with a black pupil. Ideal for stickmaking and decoy carving. Yellow/Orange Reptile Eyes. Concave/convex reptile/dinosaur eye with a highly detailed colouration. 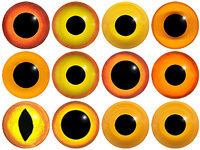 5 Pack of Topaz Bird and Teddy Bear Eyes. A top quality Topaz crystal eye with a black pupil. Ideal for stickmaking and decoy carving. Crystal Bird and Teddy Bear Eyes. A top quality crystal eye with a black pupil. Ideal for stickmaking and decoy carving. Red Glass Bird Eyes. Concave/Convex monochrome bird eyes made from crystal and hand painted. Yellow/Orange multicoloured Lizard or Snake eyes. Concave/convex reptile/dinosaur eye with a highly detailed colouration. 5 pack of Crystal Bird and Teddy Bear Eyes. A top quality crystal eye with a black pupil. Ideal for stickmaking and decoy carving. Black Flat Glass Eyes. A solid black eye in flat profile ideal for small birds or mammals where the natural iris is very dark. 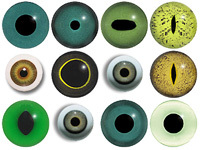 Helpful tip: If there are more than one size options for an eye then the drop down box alongside the eye will offer you the full size range. Please click on the arrow next to the box below Size: and select your preferred option (or use the TAB key and arrow keys if you are not using a mouse).